YouTube has videos. Google+ has videos. In fact, Google+ uses the YouTube backend and interface for its videos. So it makes sense that you can seamlessly move uploaded videos between the two. Except that you can't, or at least you couldn't before the latest update to the web versions of both services. You'll need to "merge" your personal YouTube channel with Google+ to take advantage, which might be a sticking point for all those YouTube users that cried foul about the whole username thing a while back. 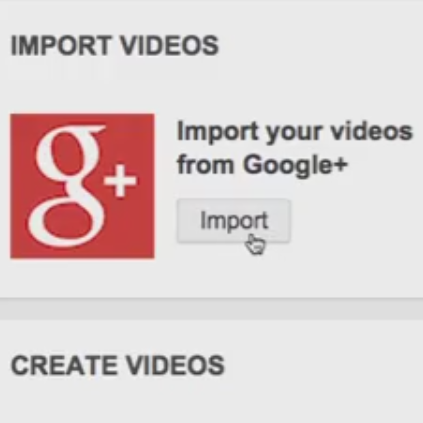 Here's Google's simple instructional video on getting uploaded G+ videos into YouTube. Videos can be reposted all at once or one at a time, and it looks like there is no real difference in presentation on the two sites. There's no easy way to import your YouTube videos back into Google+... but then that really isn't necessary, since you can just post them via a standard link.